Like every other fan, supreme hero Sai Dharam Tej is also a diehard fan of his uncle Power Star Pawan Kalyan. In Fact, SDT was encouraged by his uncle in his initial stage of career. Recently, reports came out that, Pawan Kalyan asked SDT to work for a film under the production of AM Ratnam whom he promised to work for Vedalam remake. There were also reports that, SDT will be doing a film under Pawan Kalyan’s production. Currently, Sai Dharam Tej is busy wrapping up his ongoing project Chitralahari which is slated for release on April 12th. Directed by Kishore Tirumala under Mythri Movie Makers, the makers started promotions by releasing songs from the film. 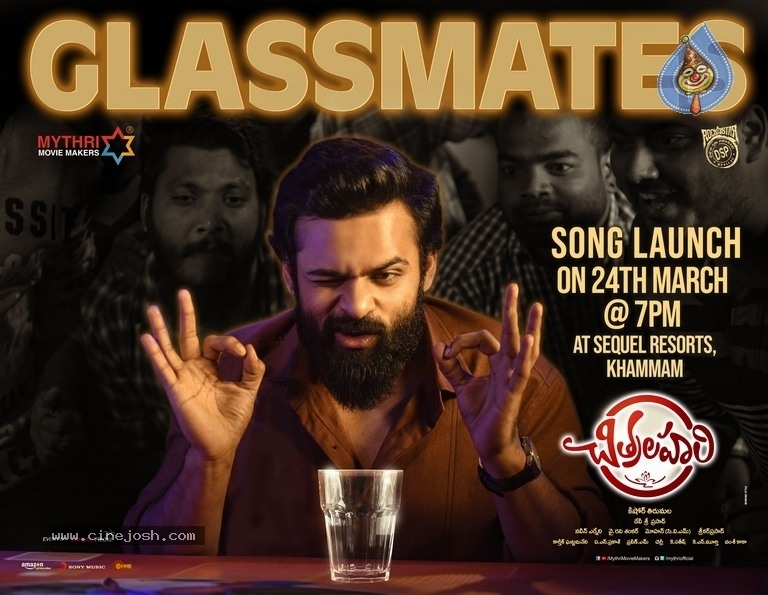 Glassmates song from Chitralahari will be released on 24th at 7 PM at Sequel Resorts in Khammam. To announce the same, they released a poster where we can observe Pawan Kalyan’s Janasena Party symbol- Glass Tumbler. SDT may not campaign for Janasena Party in the coming elections, but his support will always be there for his uncle.